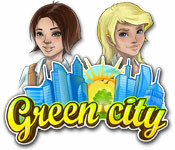 Construct the world’s most eco-friendly city in Green City! 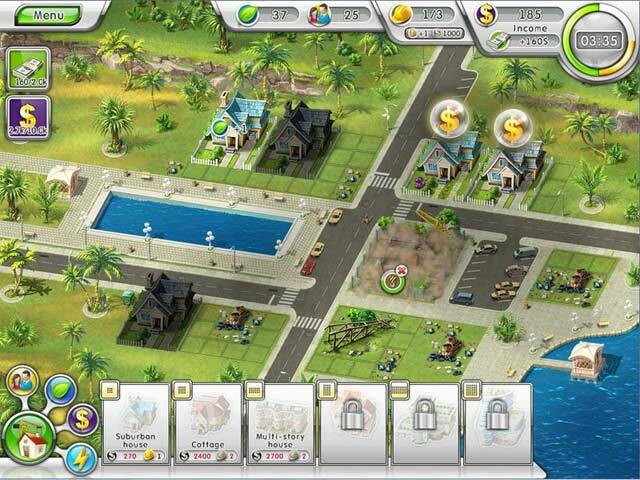 Clear away abandoned run-down houses as you redevelop the land, creating a new sunny paradise. Today is a perfect day to bring out the engineer and architect in you with this thrilling Time Management game! Green City is rated 4.2 out of 5 by 32. Rated 5 out of 5 by AdrianaIP from Nice game, which teaches also the basics of the environment This is another TM game with no timer (yes, you can get gold or silver, but even if you take forever, you can still finish the level). You get to balance the need for homes, the need for commercial buildings and money sources, with the needs of the environment, and the energy needs. Gets acquainted with widlinfe preserves, water purifiers, and air monitors, as well as wind turbines and solar plants.. And the payoff? An ugly urban blight zone get turned into a beautiful green one. Just that is enough to cheer you up. Rated 5 out of 5 by ashlee03 from More Difficult Than Most Building Games I found Green City to be a very addicting game...even after I completed all of the levels. There's not too much of a storyline, but along the way, the levels become increasingly difficult. 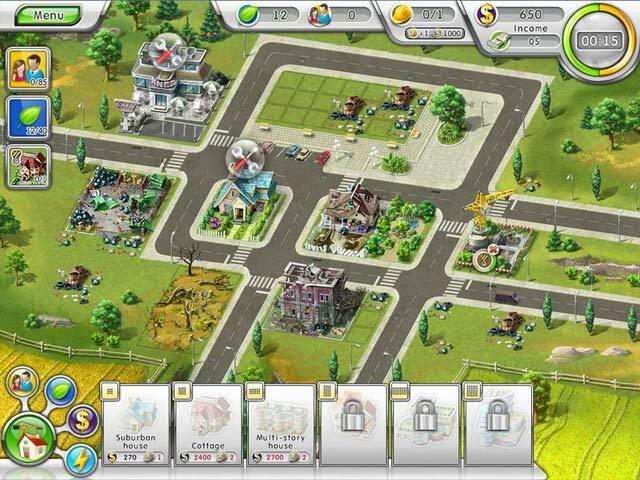 The player must decide if repairing a house, building a store, adding a power plant, upgrading a house, building a bank, bulldoze, etc is the most effective way to go in order to achieve the goals of each level. I especially liked it because the levels tend to be longer than most other TM games. I'm talking a good 10-20 minutes in some levels. One downfall to the game is that the clock begins before you can set up a good starting plan. Rated 5 out of 5 by Eunice_PR from Developing a clean city takes more than just trees This Time Management game was a lot of fun to play. The first levels introduce you to how civil engineering works. The more you play the more you learn about how the environment affects towns and cities. The game gets tougher as you go and earning gold awards are difficult due to time constraints. Great addictive game! Rated 5 out of 5 by b309 from Totally Love This Game Each level has its own unique goals and these goals differ from level to level. There are a number of ways you can play a given level and still obtain a high mark. There is no such a thing as a "one size fits all" strategy and often, the best tactics are not immediately obvious. I have played through all the levels three different times. If you like managing priorities, time, and resources, this game is guaranteed to hold your interest. Rated 5 out of 5 by SpookyPigdog from My Favourite Builder Game Generally I don't like Builder games. All that chopping trees and getting resources tired me out - which is probably why I like this game so much; there is no "getting of resources" except for extra workers and $$$. YAY! The graphics are beautiful and the levels challenging, and the number of levels is just right IMO. Its well put together and reasonably easy to understand. I truly did love it! 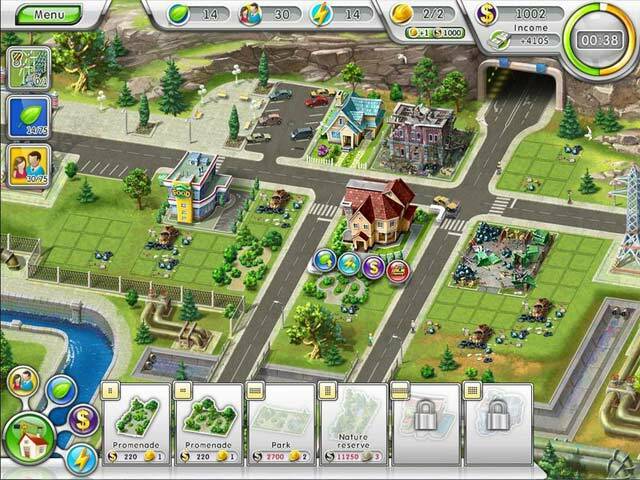 Clear away abandoned run-down houses and construct the most eco-friendly city in the world with this thrilling Time Management game!